So I went to see Jobs for the Thursday early showing. You know nowadays theaters aren’t even waiting until midnight to show Friday releases. The movie was absolutely remarkable and blew me away, despite my being a huge Pirates of Silicon Valley fan. The previews didn’t even do the movie justice. When I saw previews I thought that startup investor, entrepreneur and actor Ashton Kutcher would fail in comparison to Noah Wylie’s portrayal of Steve Jobs in the 1999 TNT film that’s now a cult classic. Kutcher has been praised over and over again for his portrayal of Jobs. We knew before the movie debuted that Kutcher had studied Jobs more intently than any other role. Several news sources, mostly tech leaning, also pointed out that with Kutcher’s investment in startups, role as startup adviser, and entrepreneurial spirit, he was paying homage to a pioneer in a field that he may love even more than acting. The script was very well written and chronicles the birth of Apple, to the ousting of Steve Jobs and then Jobs’ triumphant return to Apple and his subsequent replacing of the Board of Directors. The movie opens with Kutcher (as Jobs) unveiling the iPod at an internal Town Hall meeting. The camera angles make the viewer wonder if they are watching some old Steve Jobs footage instead of Kutcher. I’m not sure if it was in the screen play, Joshua Michael Stern’s direction, or Ashton Kutcher’s acting but the movie really stares down the barrel of entrepreneurship and takes a lot of time (possibly for dramatic effect) looking into those “startupy” moments of Apple. For example, the movie concentrates on the early stages when Wozniak has an idea and Jobs shows him the potential. It looks at the founding team in a way that resonates with two person founding teams of today’s startups. There’s a tech guy (Steve Wozniak) and a business development guy and visionary (Steve Jobs), and of course Jobs is the ultimate visionary. While the duo is adding employees 3 through 6, they are still in Jobs’ parents garage. They even have a token “young guy” who just wants to be a part of something, and they don’t even need to pay him (at first). During that sequence of events you also see Jobs pitching over 100 companies on the phone, crossing names off of a list until the one angel believes in them. That is of course Michael Markkula. Most of us startup folks knew the story of Apple well before the movie was even an idea, even before Walter Isaacson’s book came out. But we all knew the story of Facebook as well and went to see The Social Network. The movie shows the struggle between the visionary leader and founder, the board of directors, and the CEO who was actually handpicked by Jobs. It repeatedly shows the iteration upon iteration of Apple and even spends a good amount of time on Apple’s big failure under Jobs, Lisa. Some may say that Newton was the company’s biggest failure, but that wasn’t under Jobs). To tell the whole story, the movie could have gone on six hours, but in two hours and five minutes they did an amazing job of talking about the legacy of Steve Jobs and that legacy should resonate with all of our readers. 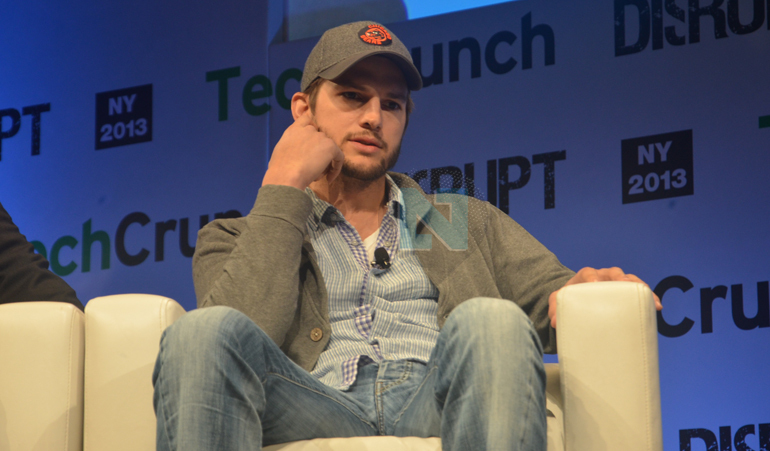 Ashton Kutcher was back on the mainstage at TechCrunch Disrupt NY 2013 after taking a year off. We first saw him at Disrupt in 2011 when he was being interviewed by Charlie Rose. It seems like so long ago. It was right after the Charlie Sheen blow up and after Kutcher had taken Sheen’s place on Two & A Half Men (which was off limits at Disrupt). On Wednesday, during a fireside chat with Mike Arrington, Kutcher along with investment partner Guy Oseary (Madonna’s manager and the founder of Maverick Records) they discussed everything from what their investment firm likes to invest in, what they see in the future, a new fund raised at $100 million dollar valuation and drugs, ammo,assholes and anonymity. When Arrington asked Kutcher about what he technologies he was looking forward to in the future, Kutcher talked first about sensors, and products that incorporated them. Then, he started talking about decentralizing currency and decentralizing security. In this part of the conversation he talked a lot about BitCoin and what the attraction is. In evaluating deals Kutcher sometimes turns to “Hacking Volume” which he described as the number of people that are hacking a solution to a problem. Kutcher says that the fact that people are so widely hacking Bitcoin validates the value of the service and the money. From there Kutcher said yes and then talked about how the BitCoin infrastructure and anonymity could be used as a vehicle for people to police themselves and eliminate “Big Brother”. Obviously this speaks to anonymity and CISPA which was recently defeated in Congress. To reiterate the value of BitCoin, Kutcher said “I think the fact that you can by drugs and ammo with it is actually a validator of the currency itself. At that point Arrington started cracking up on stage and said he could just imagine how many darts he’d have in his car. Watch this great video clip from that fireside chat below. There’s more TechCrunch Disrupt coverage from nibletz.com here. Coming through the pages of the startupmemphis blog by Commercial Appeal James Dowd I was pleasantly surprised to read that Ashton Kutcher would be returning to the main stage next week at TechCrunch Disrupt. The annual Disrupt event held in New York City is one of the most talked about startup events on the east coast. Hundreds of startups vie for the opportunity to present in the highly coveted startup alley and even more apply to pitch on the Disrupt Battlefield. Startups lucky enough to be chosen to compete on the battlefield go up against some of the hardest judges that New York and Silicon Valley have to offer. The battlefield startups are competing for a $50,000 prize but much more importan than the cash is the chance to say that your startup placed in the battlefield competition. For a startup closing a funding round down, that may be the extra push they need to make it over the top. In the four years that we’ve covered Disrupt NY (once as Nibletz 3 as TDG) we’ve seen great startups on the battlefield stage and a collection of the best fireside chats in the world. Except for Disrupt SF 2011, some of the best have been hosted by Mike Arrington. 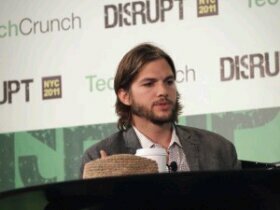 Two years ago at Disrupt NYC Ashton Kutcher sat down with Charlie Rose. This was right as he was making the transition to his new role on Two and a Half Men and questions about the show were strictly off limits. Instead Rose and Kutcher discussed his VC firm, which just two years ago, people were still concerned that actors were making a mockery of the venture capital model. Since then Kutcher has proven himself. Through his A-Grade investments he’s backed startups like 2011 Disrupt battlefield winner GetAround, Sonic Notify, Fab and Tiny Chat. Through his own angel investments Kutcher has backed AirBnB, DuoLingo, Summly and Dwolla. This year he returns to the main stage to chat about A-Grade’s investment strategy and portfolio. While Two And A Half Men was off limits TechCrunch Editor In Chief Eric Eldon says he may end up talking about his role as Steve Jobs in the biopic film that debuted at Sundance. At the Sundance film festival this week one of the biggest movies of the year is already jOBS. 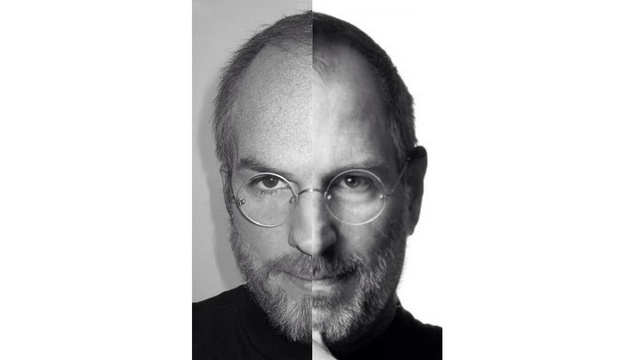 The biopic film stars startup investor and Hollywood hotshot Ashton Kutcher as Steve Jobs. While the film was screened at the event the first clips were released to the Internet depicting a conversation between Apple cofounder’s Steve Jobs and Steve Wozniak. 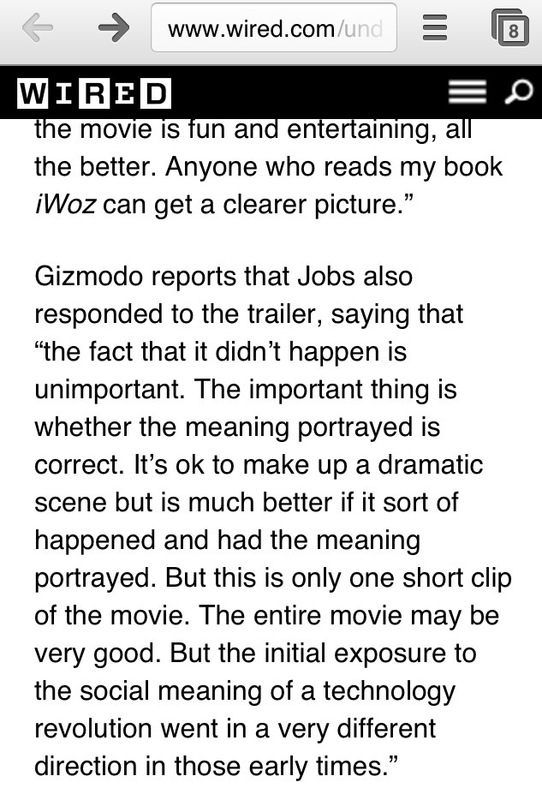 Gizmodo published this reaction piece from their good friend Woz. As you can tell Woz doesn’t seem to happy with the portrayal however he later says that if its fun and entertaining all is the better. Now we realize that both the founders names were Steve however most everyone in America knows that. They also know that Jobs passed away October 5, 2011. As most tech publications do, and we are doing right now, Wired picked up the Gizmodo piece. In their article they attribute one of the quotes to Steve Jobs. Typically, the author Hugh Hart is pretty good about reporting the facts and fact checking. We are talking about Steve Jobs here. To our knowledge not even the iPhone 6 will be able to communicate posthumously. Pittsburgh startup DuoLingo has just announced a $3.3 million dollar round of funding led by Fred Wilson’s Union Square Ventures along with actor turned tech investor Ashton Kutcher.. This article in the Post Gazette said Kutcher made this investment personally and no reference is made to his VC firm A-Grade investments. Kutcher is known to journey outside the borders of Silicon Valley with his tech investments. He heavily vets his investments for game changing technologies. Kutcher recently invested in Des Moines mobile payment startup Dwolla. Although Kutcher hails from the same area, it was more about the technology, and the entrepreneur rather than just being from the same area. With DuoLingo it’s obviously about the technology and the work that scientist/co-founders Luis von Ahn and Severin Hacker have put into the startup so far. DuoLingo is a translation software. Although there are a few very technical articles about DuoLingo’s technology, to put it into layman’s terms DuoLingo provides a platform for real life translation. While Google translate can be great for a straight up word for word translation, DuoLingo and their algorithms translate pages on the internet, in a more “real world” conversational way. Users can scroll over words if they need clues for their translations, and the program automatically detects blatant errors. The site also is designed to track words or concepts that give users trouble and to focus on those for future lessons. The next phase of DuoLingo includes adding a document translator to it’s already existing web based platform for commercial uses. To get to this point DuoLingo used a pretty extensive beta testing process where von Ahn reports that the beta testers translated tens of millions of sentences. By crowd sourcing the translations the software is able to pick up the most commonly used translations and achieve better accuracy. Von Ahn is a 33 year old junior professor at Carnegie Mellon University, where he earned the honor of A. Nico Habermann associate professor of computer science. That’s an honor given to a distinguished junior professor every three years. If you think that you’ve heard von Ahn’s name before it’s because you probably have. In 2007 von Ahn created the puzzle identifying system Captcha, the system used to verify that a human is filling out most forms. He sold that company to Google for an undisclosed sum. von Ahn’s other credits include inventing “human computation” which is a form of crowd-sourcing humans to help computers solve problems that are beyond the technology. von Ahn said that his goal with DuoLingo is to form a universally readable internet. TV and Movie star turned technology investor Ashton Kutcher was selected for the Role of Steve Jobs in an upcoming independent film about the co-founder of Apple. The movie is currently being titled Jobs: Get Involved and is said to focus on the earlier parts of his career, much in the way Pirates of Silicon Valley did. The movie will profile Jobs years starting Apple and then through NeXT and Pixar. There’s no word if the script will dip into his triumphant return to Apple and his later years. Sony Pictures has picked up the rights to Walter Isaacson’s biography about Steve Jobs which became a best seller when it’s release coincided with the death of the Apple founder. Sony is said to be in discussions with Aaron Sorkin the mastermind behind the NBC hit drama series West Wing, as well as the screen writer for the Mark Zuckerberg biographic movie “The Social Network”. Sony is reportedly looking at booth George Clooney and Noah Wylie to take on the role of Jobs for their movie. Wylie played Jobs in the cult classic Pirates of Silicon Valley which aired several times in the US after Jobs’ death. Most people in tune with the startup community have heard of Ben Milne and his payment startup Dwolla. Milne founded Dwolla in Des Moines and has no plans to take it elsewhere. Dwolla is making a name for itself by providing a payment system that isn’t dependant on a traditional banking system or credit card backing. It’s this innovative approach to payments and the fact that they’re based in Des Moines that attracted actor and tech investor Ashton Kutcher and his A-list venture fund to Dwolla’s latest Series B round (announced in February). Although announced in February Kutcher wasn’t formally announced as an investor until earlier today at Startup City Des Moines. The LA Times published a huge piece this week on celebrities lending themselves to new start ups. There are a couple ways that celebrities are doing this. Some celebrities of course, can be bought to lend their name, likeness and endorsement to a start up. Then there’s the path that singer and actor Justin Timberlake and Lady GaGa have gotten involved. Timberlake invested in and led a consortium of investors who successfully bid for MySpace from Fox Media last year. The price $53 million dollars. While some thought that the investors were going to rip the data out of the social network and sell it, they actually pumped new life into it and for the first time in years MySpace has graced the top 50 ComScore list two months in a row. Timberlake went as far as to be the MySpace pitch man at the International Consumer Electronics show in Las Vegas in January. Pitching everyone that would listen to him both big time investors, and well just everyone. Teen pop superstar Justin Bieber was also at the Consumer Electronics show however in his case it was a paid endorsement of Tosy, a robot company banking on his star power attracting potential buyers to their booth.